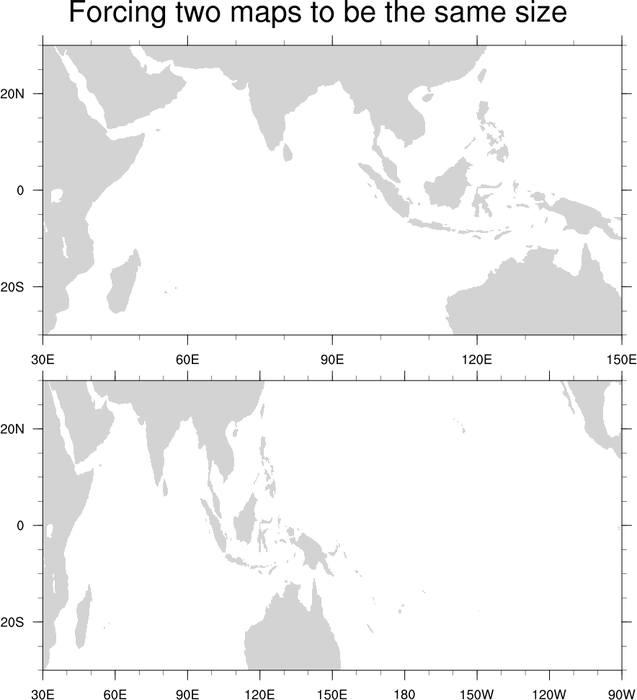 The viewport of a plot or drawable object (like a labelbar) is a rectangular subregion of NDC space that specifies where the object will be placed when drawn. 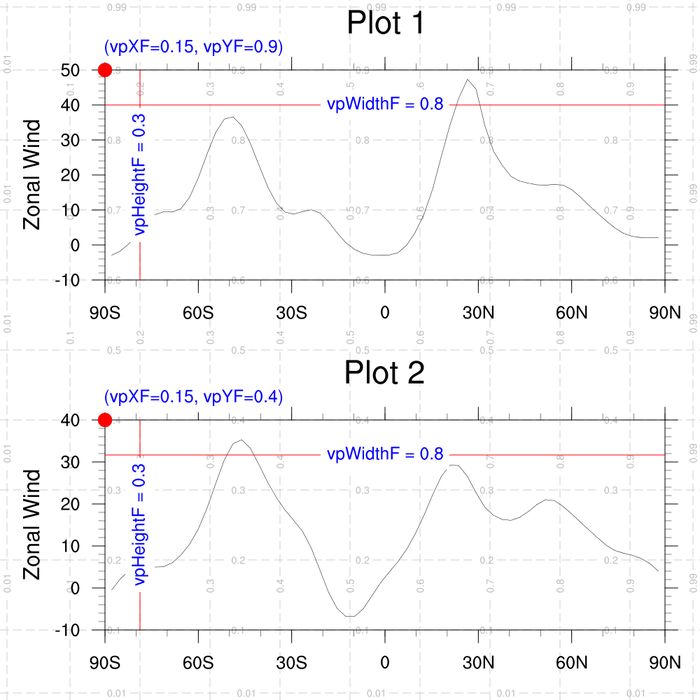 You can use the special resources vpXF, vpYF, vpWidthF, and vpHeightF to reposition and resize the plots. 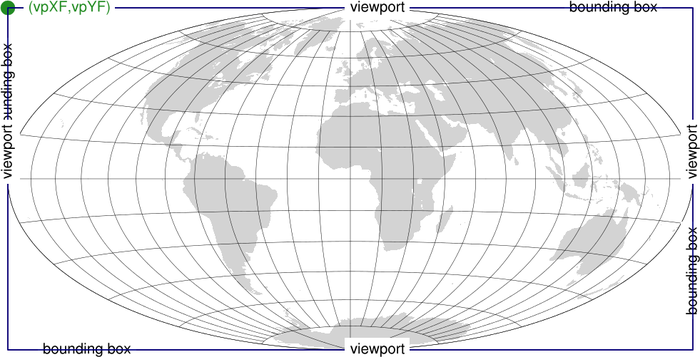 The precise meaning of the viewport depends on the object. 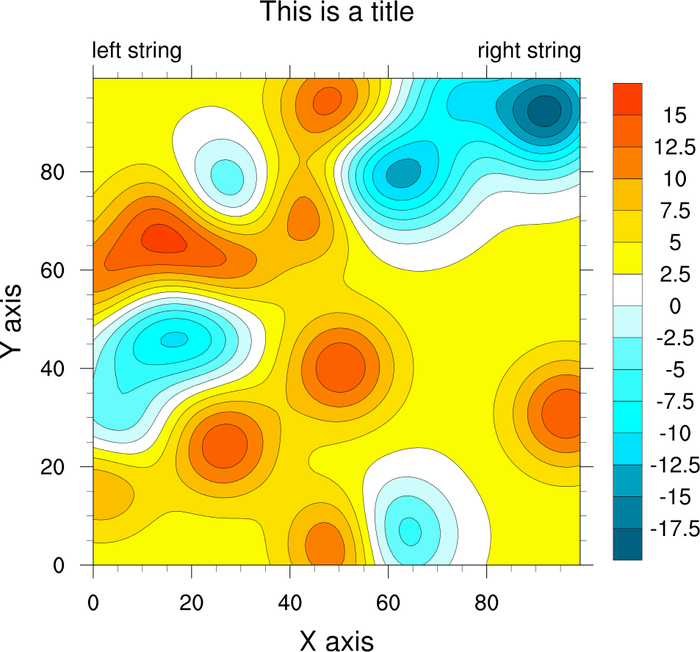 For example, for XY plots, the viewport specifies where the grid containing the curves will be placed. The labeling, if any, will be drawn outside of the viewport. For text strings, the viewport is simply a rectangle surrounding the text string. 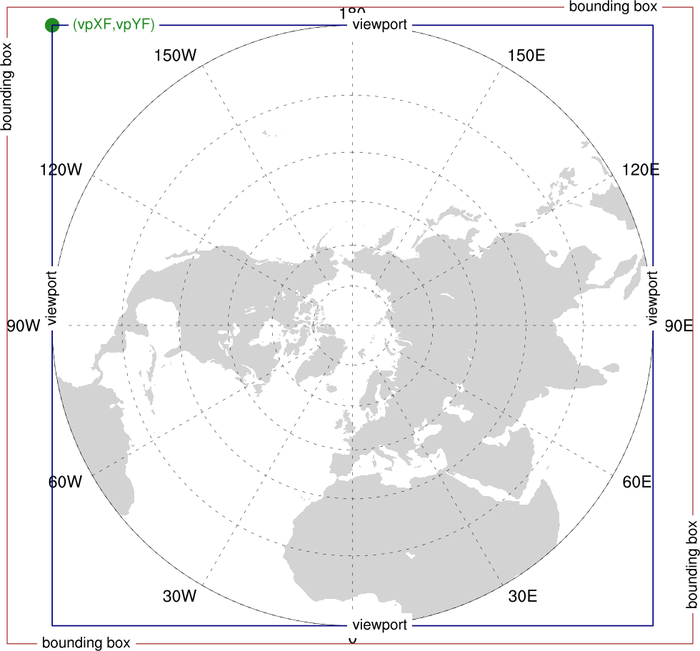 A bounding box is the smallest rectangle in NDC space that contains all of a particular object's attributes. 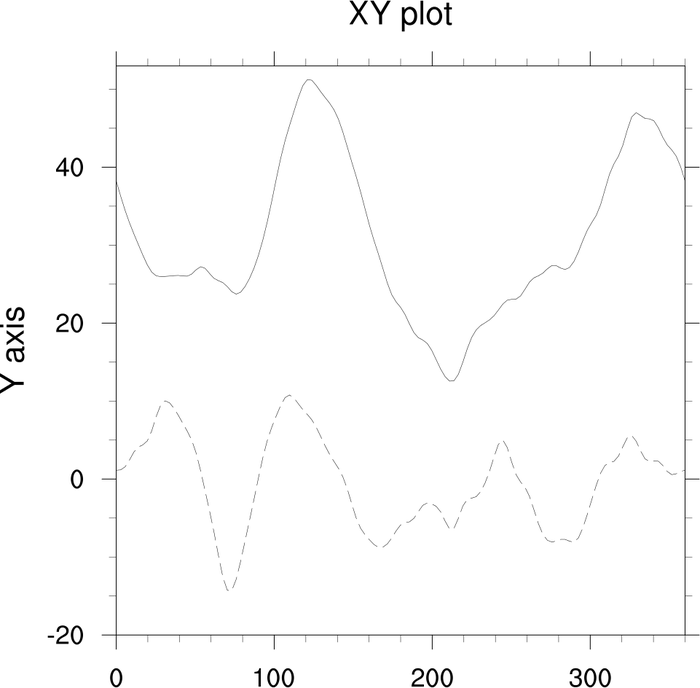 For example, for an XY plot, this would include the area containing the tickmarks, tickmark labels, the main title, X/Y axis titles, legend, and anything else associated with the XY plot. For a text string, the bounding box is the same as the viewport. The examples below compare the viewports and bounding boxes for various graphical objects. They also show how to position and resize objects. 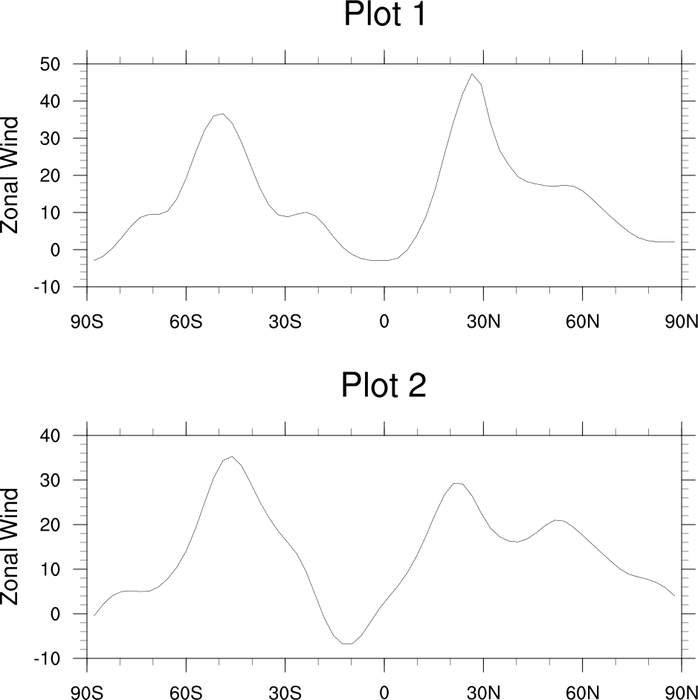 For more information on resizing plots, see the Resizing page. 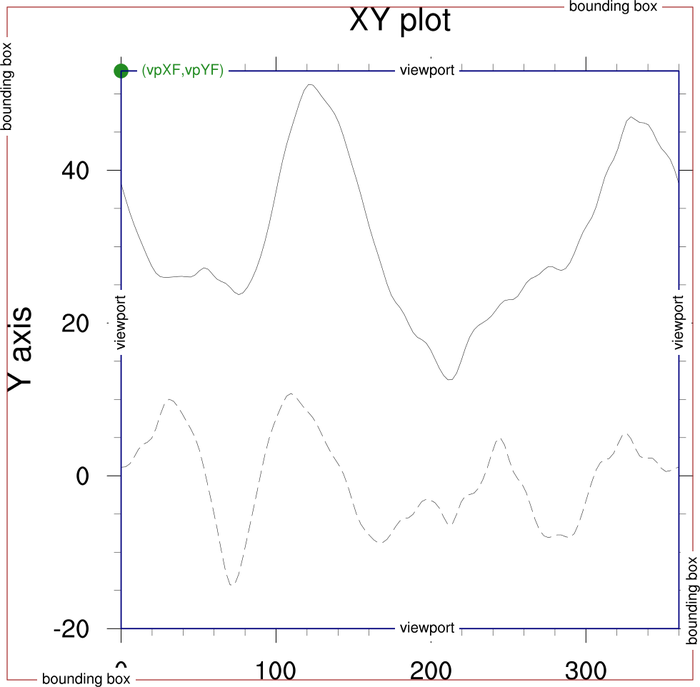 viewport_1.ncl: This example draws an XY plot with its viewport and bounding box outlined in the second and third frames. The green dot shows the location represented by vpXF and vpYF, which is always the upper left corner of a graphical object. 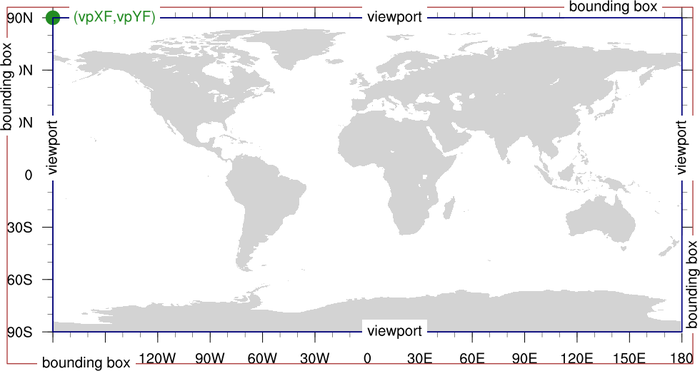 The width and height of the viewport are represented by the resources vpWidthF and vpHeightF. These values are in NDC space. The viewport values are retrieved using getvalues. The bounding box is retrieved using the NhlGetBB function. 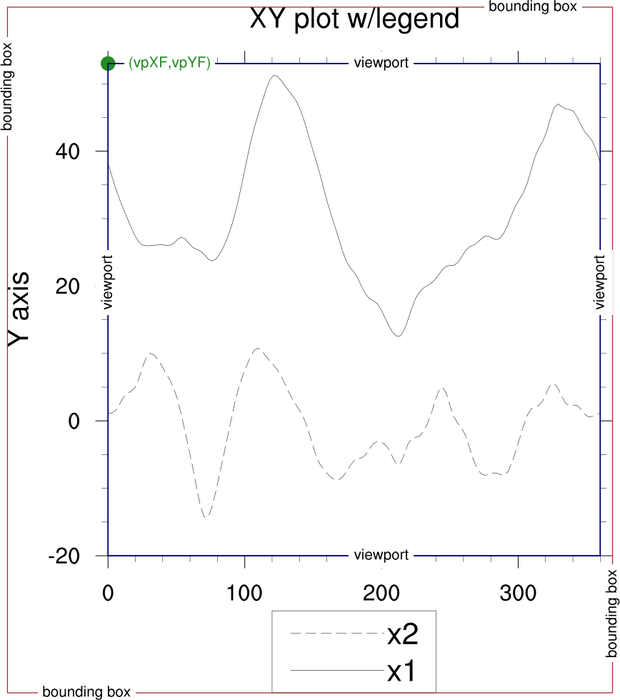 viewport_2.ncl: This example draws a contour plot with a vertical labelbar. The viewport and bounding box are outlined in the second frame. viewport_3.ncl: This example draws three different maps with their viewport and bounding boxes outlined. Note that since the Hammer map (third frame) has no additional titles or tickmarks, the viewport and bounding box are the same. 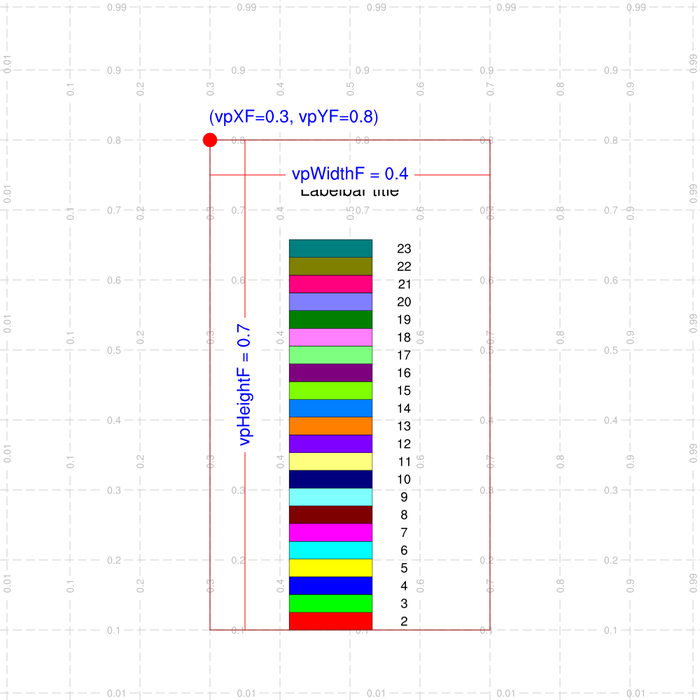 viewport_4.ncl: This example draws two XY plots on the same page using viewport resources vpXF, vpYF, vpWidthF, and vpHeightF to position and resize the plots. The second frame shows the use of drawNDCGrid, which draws a labeled NDC grid. 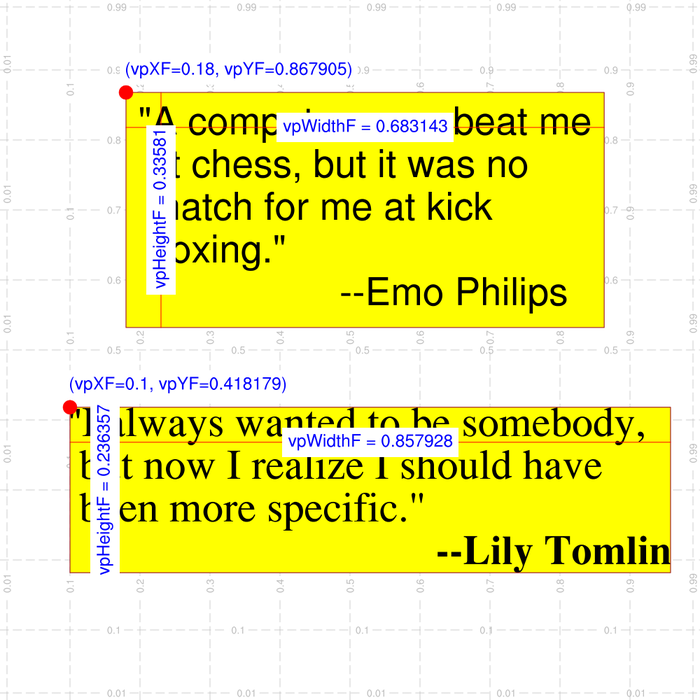 This is useful for placing further text, polymarkers, polygons, and/or polylines in NDC coordinates near the plot. viewport_5.ncl: This example draws a labelbar on one frame, and some text strings on another, with illustrations showing the bounding box and viewport. Note the labelbar has quite a bit of white space around it. 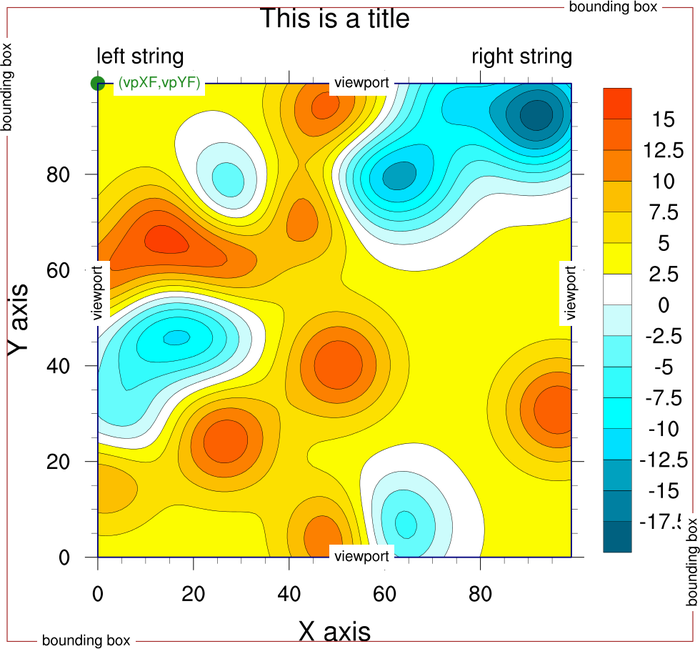 This is due to a rather complicated algorithm that is used to determine how to create the labelbar and allow enough space so it doesn't overlap with a plot. See this posting on ncl-talk "Label bar position" for more details. The top text string in the second frame has white space around it. You can turn this off by setting res@txPerimSpaceF = 0.
viewport_6.ncl: By default, you can't change the width and height of a map. 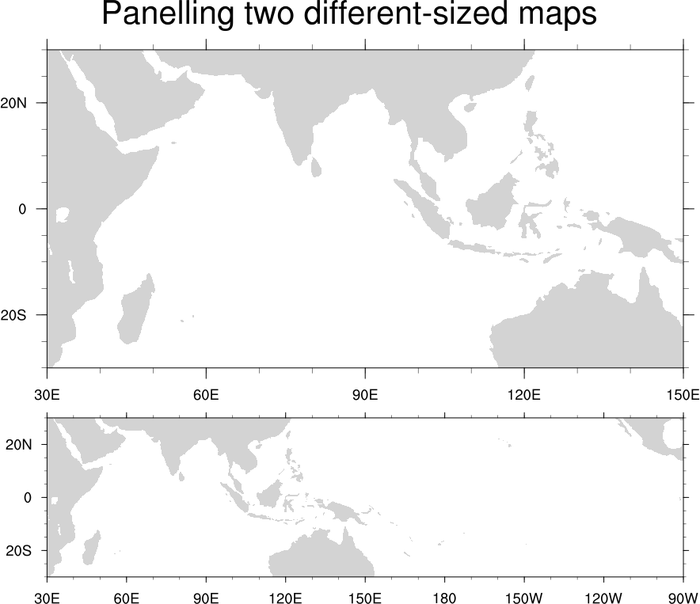 This example shows how to force a map to be a different width and height by further setting the mpShapeMode resource to "FreeAspect". This will skew your map, so be careful with this resource.